Ozzy Osbourne returned to his native Birmingham, England on Thursday to launch a new tram named after him. 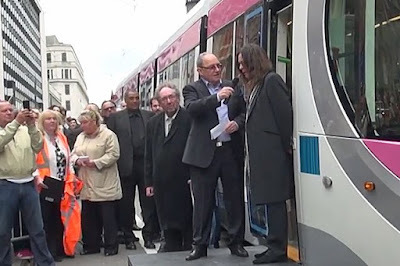 The Irish Examiner reports the Black Sabbath rocker unveiled the tram in front of a packed crowd on Corporation Street in the city centre. "It’s great to be here. Thank you very much,” Ozzy told the crowd. “We never thought when we started in 1968 that we’d be here. It’s been an incredible journey. Trams returned to Birmingham last December after a 60-year absence. The tram-naming ceremony was organized by Centro, the delivery arm of the West Midlands Integrated Transport Authority (ITA). “Such an honour having @OzzyOsbourne onboard today!” tweeted Midland Metro. Ozzy and Black Sabbath will continue their farewell tour with summer dates in Europe starting June 1 in Budapest, Hungary before returning to North America for more shows this fall.